Vitamin D is a nutrient that your body uses to meet a variety of critical health needs, including maintenance of your normal nerve and immune function and the support of proper bone formation. You can develop a deficiency of this vitamin if you don't absorb it properly in your small intestine. Potential reasons for vitamin D absorption problems include fat-absorption disorders, the presence of certain other diseases and the after-effects of gastric bypass surgery. Vitamin D belongs to a class of nutrients called fat-soluble vitamins. As the name implies, you need dietary fat to help break down these vitamins and absorb them into your body. Outside of fatty fish, egg yolks, cheese, beef liver, fish liver oil and certain mushroom species, vitamin D is scarce in natural foods. 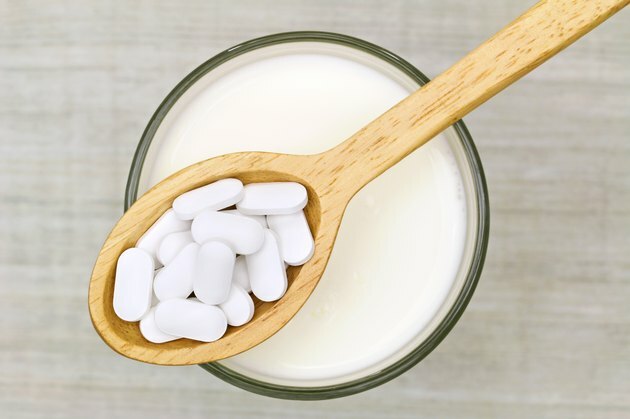 As a result, most people in the U.S. rely on milk, orange juice, cereal and other artificially fortified foods as dietary sources of the vitamin. Additional amounts of vitamin D come from internal chemical reactions triggered by direct exposure to the ultraviolet rays in sunlight. Since you cannot absorb vitamin D into your system without an accompanying intake of fat, any disorder that disrupts your ability to absorb fat can also disrupt your ability to absorb vitamin D, according to the National Institutes of Health Office of Dietary Supplements. Potential sources of fat-absorption problems include certain forms of liver disease and mucus buildup in the digestive tract associated with the lung disorder cystic fibrosis. You can also develop fat absorption difficulties if you have a gastrointestinal disorder called Crohn's disease. The presence of Crohn's disease can also directly affect your body's ability to absorb vitamin D, according to a study published in 2011 in the Crohn's and Colitis Foundation of America's official journal, "Inflammatory Bowel Diseases." When compared to people who don't have Crohn's or any other gastrointestinal disorder, the average Crohn's patient absorbs roughly 30 percent less of the vitamin D present in his or her diet, the authors of the study report. However, not all people with Crohn's experience the same degree of difficulty in processing their food, and doctors must perform tests to determine the effects of malabsorption in any given individual. If you are obese and undergo gastric bypass surgery, your food will typically be routed around part of your upper small intestine. Since vitamin D absorption takes places in your small intestine, this re-routing can reduce your chances to properly extract the vitamin from the foods in your diet, the Office of Dietary Supplements says. In turn, reduced extraction can lead to vitamin D deficiency. In addition, obese people who don't undergo gastric bypass can hold abnormally high amounts of vitamin D in their fatty tissues. While this is not a problem of fat absorption, it can still result in lowered availability of the nutrient in other areas of your body. Consult your doctor for more information on problems related to vitamin D absorption and fat absorption.